FLHSMV joins the National Highway Traffic Safety Administration (NHTSA) in recognizing National Teen Driver Safety Week in October each year and highlighting Teen Arrive Alive Day the Tuesday of Teen Driver Safety Week with events throughout the state to remind teens and adults around them how to stay safe behind the wheel. 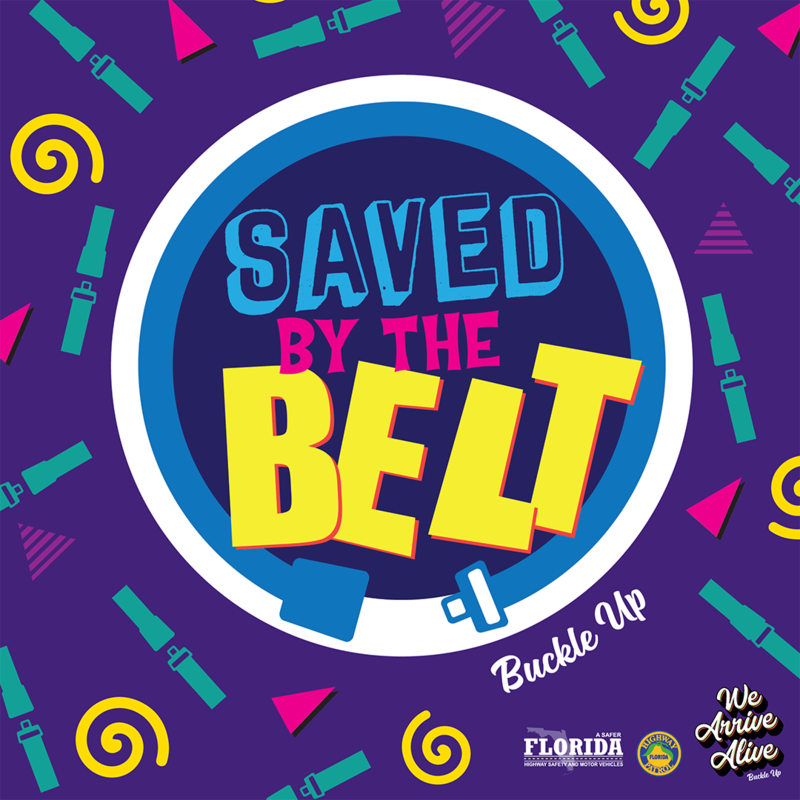 FLHSMV’s We Arrive Alive campaign initiative gives teens the tools and language to take ownership of their driving habits, cementing safe behaviors with affirmative statements about why buckling up is so important. 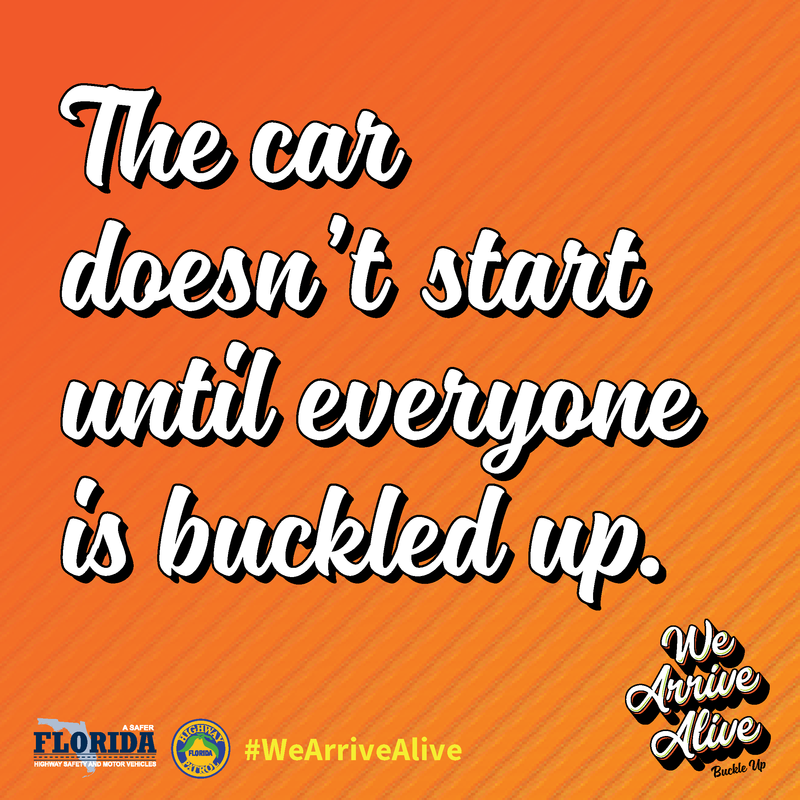 The car doesn’t start until everyone is buckled up. 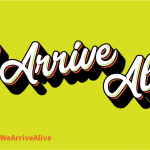 We Arrive Alive. For me, it clicks. 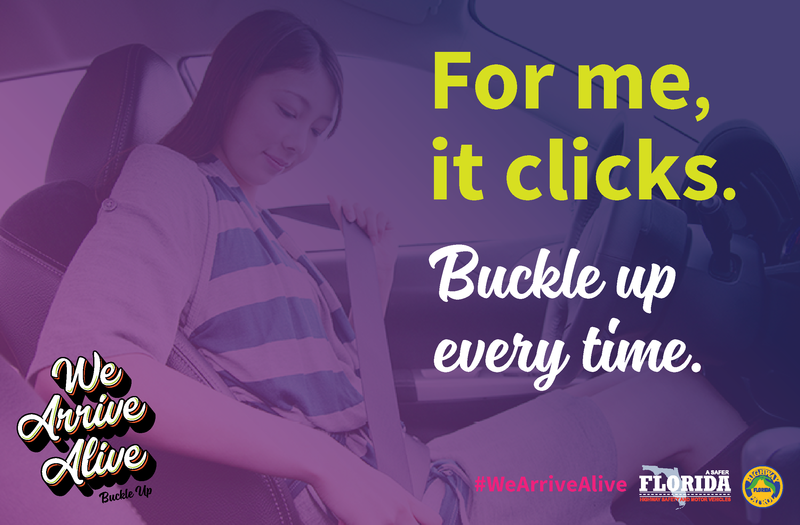 Buckle up every time. 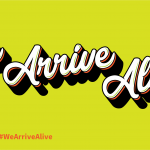 We Arrive Alive. 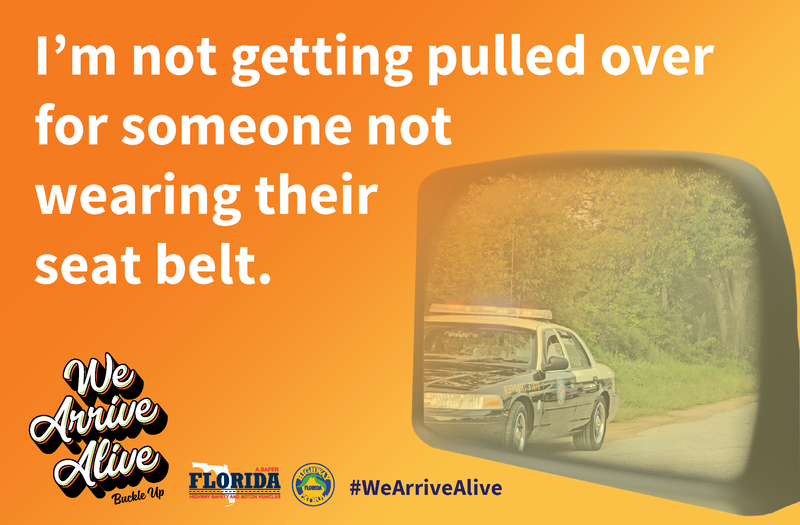 I’m not getting pulled over for someone not wearing their seat belt. 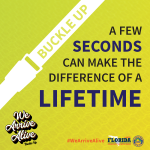 We Arrive Alive. 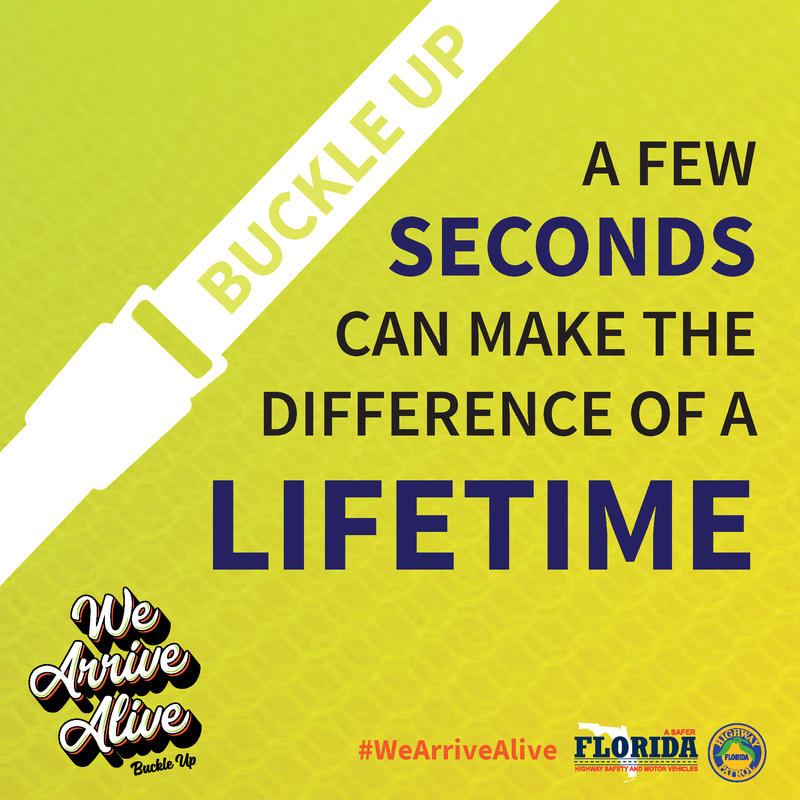 The few seconds it takes to buckle up makes the difference of a lifetime. 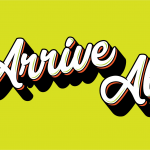 We Arrive Alive. 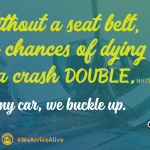 Without a seat belt, chances of dying in a crash DOUBLE. 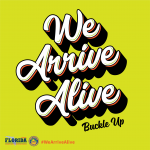 In my car, we buckle up. We Arrive Alive. No more lame excuses. Buckle up. 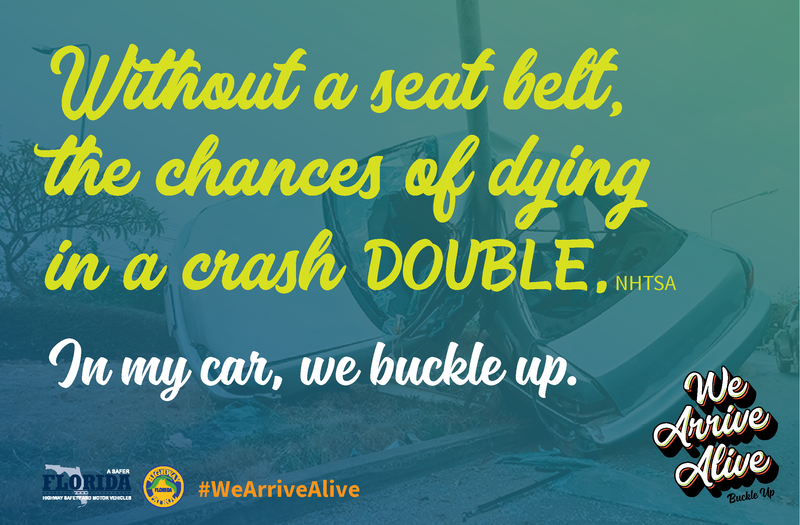 We Arrive Alive. 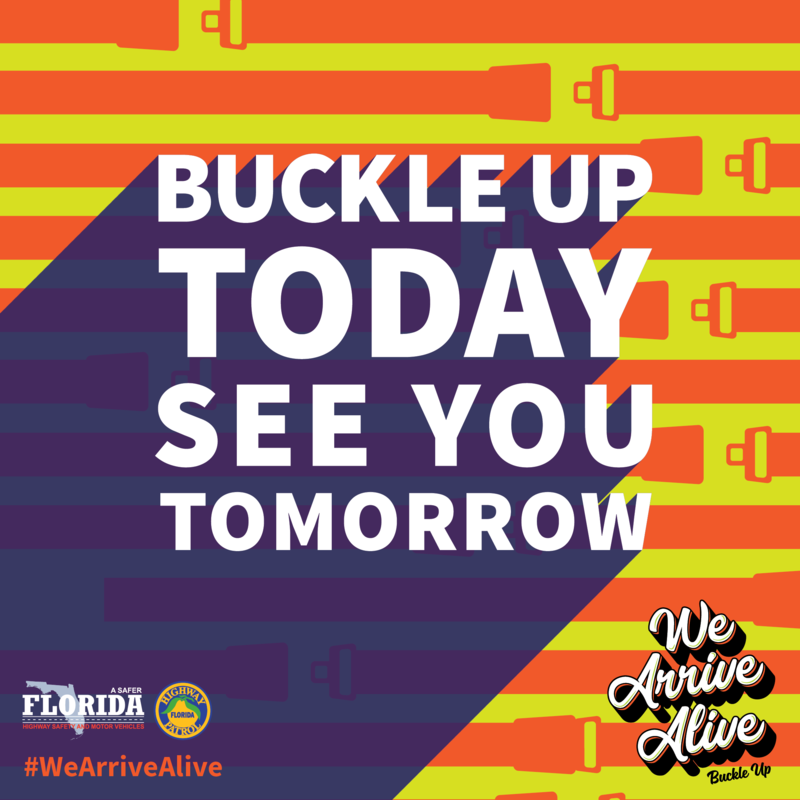 Buckle up today, see you tomorrow. 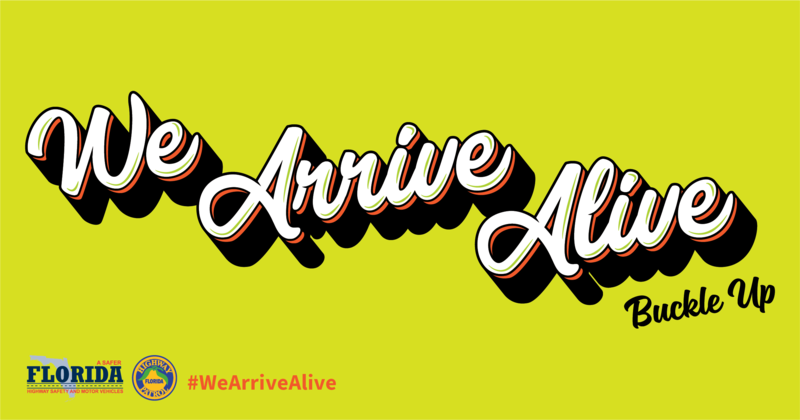 We Arrive Alive. Parents can rescind a minor’s driver license. The parent or guardian who signs the Parental Consent Form can rescind responsibility for their minor’s driving and cancel the minor’s license. If teens get six or more points on their license within 12 months, their license is restricted to “Business Purposes Only” for one year. 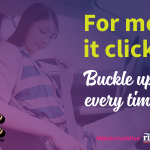 If teens receive six points on their driving record within a 12 month period, driving privileges are automatically restricted to Business Purposes Only for 12 months or until age 18, whichever happens first. If additional points are received during this restricted period, the restriction is extended 90 days for each additional point. If under 21, it’s ZERO TOLERANCE for drinking and driving. Drivers under the age of 21 with a blood alcohol level of .02 percent or more will have their license immediately suspended for six months. A second offense will result in a one year suspension. Refusal to submit to testing (first offense) results in a suspension of 12 months, 18 months on a second offense. If a teen receives a moving violation conviction with a Learner’s License, they have one more year until they can get an Operator’s License. 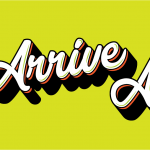 If a teen receives a moving traffic conviction with a Learner’s License, the one-year period required to hold the Learner’s License will be extended for one year from the date of the conviction, or until 18 years old, whichever happens first. 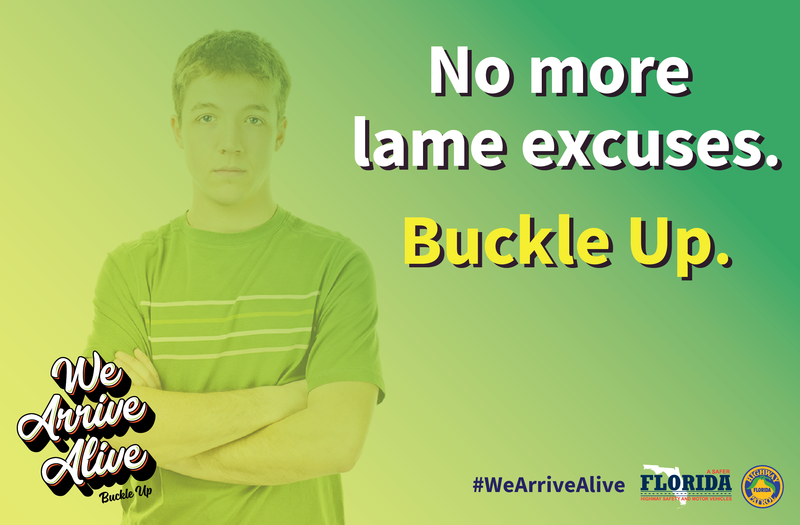 Teens must be in compliance with school attendance, or they will be ineligible to obtain or maintain their license. 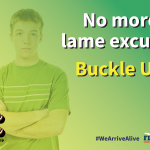 If not in compliance with school attendance, a teen’s driving privilege can be suspended until proof of attendance in school for 30 consecutive days has been provided. If convicted of possession of tobacco, minors lose their license for a minimum of 30 days. If convicted for possession of tobacco or nicotine products under the age of 18, the minor’s license will be suspended for 30 days or more. 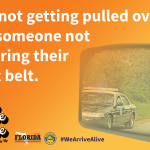 Graduated Driver Licensing (GDL) laws in Florida allow young drivers to safely gain experience under lower-risk conditions before obtaining full driving privileges. In 1996, Florida became the first state to enact GDL laws and since then every state has adopted the GDL program in some capacity. For more information on licensing requirements for teens and GDL laws, please click here. 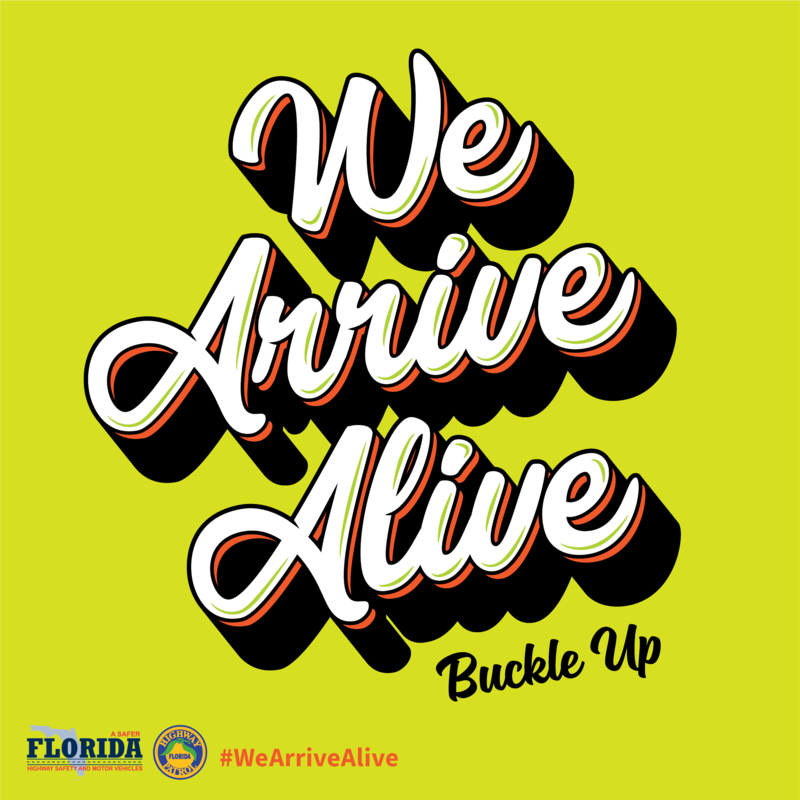 Put on your seat belt and make sure all your passengers buckle up, too. Keep passengers at a minimum. 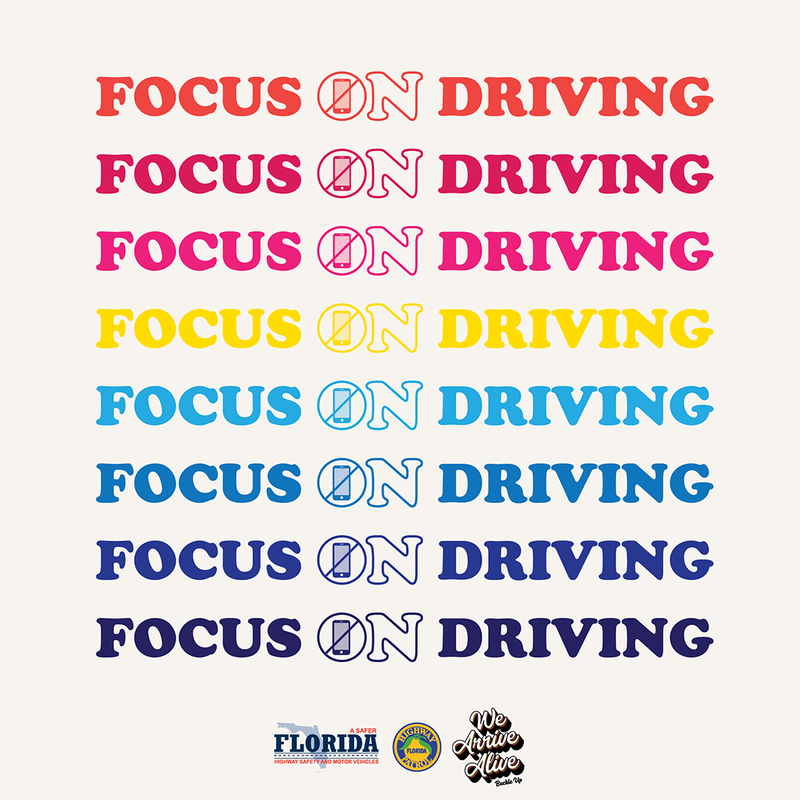 Extra passengers can be distracting for an inexperienced teen driver. Never try to fit more people in the car than you have seat belts for them to use. When driving to a new place, get complete directions before you go. Figure out exactly where you are going before you head down the road. Maintain your car’s optimum performance. Check your tires and make sure they are inflated to the right pressure according to your owner’s manual. 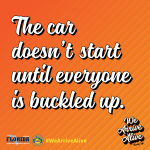 Bald tires, a slipping transmission, bad brakes, a dirty windshield or a hesitant engine could lead to accidents. Make sure your car has gas in it. Don’t ride around with the gauge on empty and risk getting stranded somewhere unsafe. Be responsible, don’t drink and drive, and don’t ride with anyone who has been drinking. Call parents or friends to take you home if you need a ride. Never drive under the influence of drugs. Don’t ride with anyone who has been using drugs. Even some over the counter drugs can make you drowsy so check labels for warnings. Download the Social Media Posts PDF and click on the thumbnails below to make posting on social media quick and easy! 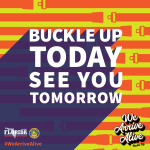 Make sure to use the campaign hashtag #WeArriveAlive.